Writing is one of the most important skills that everyone needs to learn. It is not just for school, as this skill is something that they will practice until they are working and even on the job. It is never too early to build the writing skill in your children. With some simple practices at home, you can create a place where your children can develop their writing skills. You should encourage your kids to write more and write better. 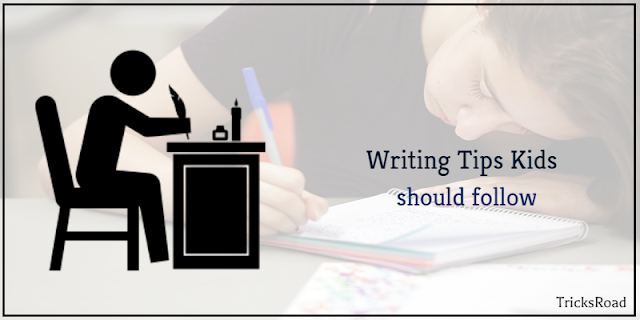 With the following kids writing tips, you will be able to help your kids best at writing. This will help you and your kids to be a better writer. Let’s start and see some best kids writing tips for your children. Check out the below kids writing tips and make sure to do them at home and you will be amazed at how your children will progress with their writing. Reading and writing go hand in hand. If you want your child to be a good writer, you need to encourage them to be a voracious reader. When they read, they not only get to add new words to their vocabulary, but they are exposed to different types of writing depending on the genre or literary form they are reading. Talk to your child and see what types of stories does he or she like to read and buy those kinds of books for them. You can even read to them so that you can use it as a bonding time too. If you have enough budget, you can let them enroll in a course, such as creative writing to further develop their skills. The best thing is they can finish this from the comfort of their own homes. There are websites, such as WritingSamurai.com that offer courses such as creative writing, essay writing and the like. Cultivate an environment at home where you encourage your children to express themselves through words. Ask them simple things like describing a certain item at home, or regularly asking them how their day went, where they go and describe the things they have seen, smelled, heard, taste, and felt. If your child does not see you writing yourself, they may never understand why you are putting so much value into it. Let them see you writing, whether it is a daily journal or a thank you note. They will get that writing is not only limited to the things they do at school, like worksheets or their homework. You can even test their sentence construction skills when you read aloud your own letters and notes but add a few errors and see if your children can detect them. From there, you can gradually get them to write notes with you so that they can be involved in the writing too. why not gift your child a one of a kind journal so that they will feel excited to write their own diary? Or maybe some sets of colorful or beautiful pens? Or, you can use technology. If blogging is what your child can get into, why not buy them a domain name for their own site, or if there is enough budget, get them a camera that they can use to take the pictures they will put up on their blogs. These were few best kids writing tips for your children. At the initial stage of kids, if proper guidance provided then your kids will do better for sure. Make sure your kids are following these kids writing tips and see them growing with good and insightful writing skills.